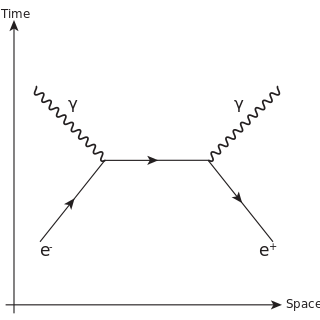 In particle physics, a fermion is a particle that follows Fermi–Dirac statistics. These particles obey the Pauli exclusion principle. Fermions include all quarks and leptons, as well as all composite particles made of an odd number of these, such as all baryons and many atoms and nuclei. Fermions differ from bosons, which obey Bose–Einstein statistics. Particle physics is a branch of physics that studies the nature of the particles that constitute matter and radiation. Although the word particle can refer to various types of very small objects, particle physics usually investigates the irreducibly smallest detectable particles and the fundamental interactions necessary to explain their behaviour. By our current understanding, these elementary particles are excitations of the quantum fields that also govern their interactions. The currently dominant theory explaining these fundamental particles and fields, along with their dynamics, is called the Standard Model. Thus, modern particle physics generally investigates the Standard Model and its various possible extensions, e.g. to the newest "known" particle, the Higgs boson, or even to the oldest known force field, gravity. In quantum statistics, a branch of physics, Fermi–Dirac statistics describe a distribution of particles over energy states in systems consisting of many identical particles that obey the Pauli exclusion principle. It is named after Enrico Fermi and Paul Dirac, each of whom discovered the method independently. The Pauli exclusion principle is the quantum mechanical principle which states that two or more identical fermions cannot occupy the same quantum state within a quantum system simultaneously. 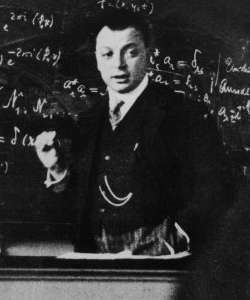 This principle was formulated by Austrian physicist Wolfgang Pauli in 1925 for electrons, and later extended to all fermions with his spin–statistics theorem of 1940. In particle physics, an elementary particle or fundamental particle is a subatomic particle with no sub structure, thus not composed of other particles. Particles currently thought to be elementary include the fundamental fermions, which generally are "matter particles" and "antimatter particles", as well as the fundamental bosons, which generally are "force particles" that mediate interactions among fermions. A particle containing two or more elementary particles is a composite particle. , whose electric charge is negative one elementary charge. Electrons belong to the first generation of the lepton particle family, and are generally thought to be elementary particles because they have no known components or substructure. The electron has a mass that is approximately 1/1836 that of the proton. Quantum mechanical properties of the electron include an intrinsic angular momentum (spin) of a half-integer value, expressed in units of the reduced Planck constant, ħ. As it is a fermion, no two electrons can occupy the same quantum state, in accordance with the Pauli exclusion principle. Like all elementary particles, electrons exhibit properties of both particles and waves: they can collide with other particles and can be diffracted like light. The wave properties of electrons are easier to observe with experiments than those of other particles like neutrons and protons because electrons have a lower mass and hence a longer de Broglie wavelength for a given energy. , with a positive electric charge of +1e elementary charge and a mass slightly less than that of a neutron. Protons and neutrons, each with masses of approximately one atomic mass unit, are collectively referred to as "nucleons". In quantum physics, quantum state refers to the state of an isolated quantum system. A quantum state provides a probability distribution for the value of each observable, i.e. for the outcome of each possible measurement on the system. Knowledge of the quantum state together with the rules for the system's evolution in time exhausts all that can be predicted about the system's behavior. In classical physics and general chemistry, matter is any substance that has mass and takes up space by having volume. All everyday objects that can be touched are ultimately composed of atoms, which are made up of interacting subatomic particles, and in everyday as well as scientific usage, "matter" generally includes atoms and anything made up of them, and any particles that act as if they have both rest mass and volume. However it does not include massless particles such as photons, or other energy phenomena or waves such as light or sound. Matter exists in various states. These include classical everyday phases such as solid, liquid, and gas – for example water exists as ice, liquid water, and gaseous steam – but other states are possible, including plasma, Bose–Einstein condensates, fermionic condensates, and quark–gluon plasma. In particle physics, force carriers or messenger particles or intermediate particles are particles that give rise to forces between other particles. These particles are bundles of energy (quanta) of a particular kind of field. There is one kind of field for every type of elementary particle. For instance, there is an electric field whose quanta are electrons, and an electromagnetic field whose quanta are photons. The force carrier particles that mediate the electromagnetic, weak, and strong interactions are called gauge bosons. Paul Adrien Maurice Dirac was an English theoretical physicist who is regarded as one of the most significant physicists of the 20th century. Enrico Fermi was an Italian and naturalized-American physicist and the creator of the world's first nuclear reactor, the Chicago Pile-1. He has been called the "architect of the nuclear age" and the "architect of the atomic bomb". He was one of very few physicists to excel in both theoretical physics and experimental physics. Fermi held several patents related to the use of nuclear power, and was awarded the 1938 Nobel Prize in Physics for his work on induced radioactivity by neutron bombardment and for the discovery of transuranium elements. He made significant contributions to the development of statistical mechanics, quantum theory, and nuclear and particle physics. Majorana fermions (each its own antiparticle). Most Standard Model fermions are believed to be Dirac fermions, although it is unknown at this time whether the neutrinos are Dirac or Majorana fermions (or both). Dirac fermions can be treated as a combination of two Weyl fermions. :106 In July 2015, Weyl fermions have been experimentally realized in Weyl semimetals. 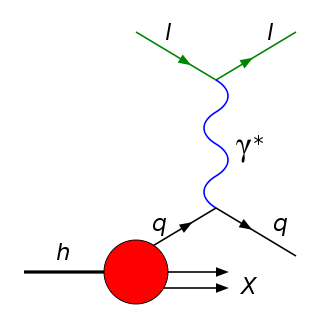 The analogy between the Skyrme field and the Higgs field of the electroweak sector has been used  to postulate that all fermions are skyrmions. This could explain why all known fermions have baryon or lepton quantum numbers and provide a physical mechanism for the Pauli exclusion principle. ↑ Weiner, Richard M. (2010). "The Mysteries of Fermions". International Journal of Theoretical Physics. 49 (5): 1174–1180. arXiv: 0901.3816 . Bibcode:2010IJTP...49.1174W. doi:10.1007/s10773-010-0292-7. In particle physics, a baryon is a type of composite subatomic particle which contains an odd number of valence quarks. Baryons belong to the hadron family of particles, which are the quark-based particles. They are also classified as fermions, i.e., they have half-integer spin. In chemistry and physics, a nucleon is either a proton or a neutron, considered in its role as a component of an atomic nucleus. The number of nucleons in a nucleus defines an isotope's mass number. 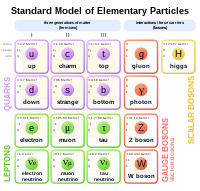 The Standard Model of particle physics is the theory describing three of the four known fundamental forces in the universe, as well as classifying all known elementary particles. It was developed in stages throughout the latter half of the 20th century, through the work of many scientists around the world, with the current formulation being finalized in the mid-1970s upon experimental confirmation of the existence of quarks. Since then, confirmation of the top quark (1995), the tau neutrino (2000), and the Higgs boson (2012) have added further credence to the Standard Model. In addition, the Standard Model has predicted various properties of weak neutral currents and the W and Z bosons with great accuracy. A timeline of atomic and subatomic physics. Degenerate matter is a highly dense state of fermionic matter in which particles must occupy high states of kinetic energy in order to satisfy the Pauli exclusion principle. The description applies to matter composed of electrons, protons, neutrons or other fermions. The term is mainly used in astrophysics to refer to dense stellar objects where gravitational pressure is so extreme that quantum mechanical effects are significant. This type of matter is naturally found in stars in their final evolutionary states, like white dwarfs and neutron stars, where thermal pressure alone is not enough to avoid gravitational collapse. In the physical sciences, subatomic particles are particles much smaller than atoms. The two types of subatomic particles are: elementary particles, which according to current theories are not made of other particles; and composite particles. Particle physics and nuclear physics study these particles and how they interact. The idea of a particle underwent serious rethinking when experiments showed that light could behave like a stream of particles as well as exhibiting wave-like properties. This led to the new concept of wave–particle duality to reflect that quantum-scale "particles" behave like both particles and waves. Another new concept, the uncertainty principle, states that some of their properties taken together, such as their simultaneous position and momentum, cannot be measured exactly. In more recent times, wave–particle duality has been shown to apply not only to photons but to increasingly massive particles as well. In particle physics, annihilation is the process that occurs when a subatomic particle collides with its respective antiparticle to produce other particles, such as an electron colliding with a positron to produce two photons. The total energy and momentum of the initial pair are conserved in the process and distributed among a set of other particles in the final state. Antiparticles have exactly opposite additive quantum numbers from particles, so the sums of all quantum numbers of such an original pair are zero. Hence, any set of particles may be produced whose total quantum numbers are also zero as long as conservation of energy and conservation of momentum are obeyed.
. The W bosons have either a positive or negative electric charge of 1 elementary charge and are each other's antiparticles. The Z boson is electrically neutral and is its own antiparticle. The three particles have a spin of 1. The W bosons have a magnetic moment, but the Z has none. All three of these particles are very short-lived, with a half-life of about 3×10−25 s. Their experimental discovery was a triumph for what is now known as the Standard Model of particle physics. In nuclear physics and particle physics, isospin (I) is a quantum number related to the strong interaction. More specifically, isospin symmetry is a subset of the flavour symmetry seen more broadly in the interactions of baryons and mesons. Deep inelastic scattering is the name given to a process used to probe the insides of hadrons, using electrons, muons and neutrinos. It provided the first convincing evidence of the reality of quarks, which up until that point had been considered by many to be a purely mathematical phenomenon. It is a relatively new process, first attempted in the 1960s and 1970s. It is an extension of Rutherford scattering to much higher energies of the scattering particle and thus to much finer resolution of the components of the nuclei. Asım Orhan Barut was a Turkish-American theoretical physicist. The timeline of particle physics lists the sequence of particle physics theories and discoveries in chronological order. The most modern developments follow the scientific development of the discipline of particle physics. In quantum mechanics, a boson is a particle that follows Bose–Einstein statistics. Bosons make up one of the two classes of particles, the other being fermions. 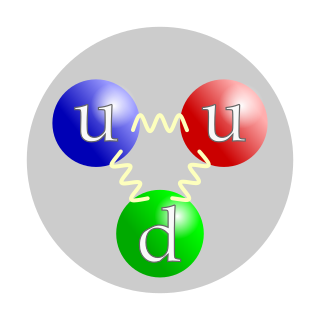 The name boson was coined by Paul Dirac to commemorate the contribution of Indian physicist and professor of physics at University of Calcutta and at University of Dhaka, Satyendra Nath Bose in developing, with Albert Einstein, Bose–Einstein statistics—which theorizes the characteristics of elementary particles. This page is a glossary of terms in string theory, including related areas such as supergravity, supersymmetry, and high energy physics. The idea that matter consists of smaller particles and that there exists a limited number of sorts of primary, smallest particles in nature has existed in natural philosophy at least since the 6th century BC. Such ideas gained physical credibility beginning in the 19th century, but the concept of "elementary particle" underwent some changes in its meaning: notably, modern physics no longer deems elementary particles indestructible. Even elementary particles can decay or collide destructively; they can cease to exist and create (other) particles in result.